Bennu is the target of NASA’s Origins, Spectral Interpretation, Resource Identification, Security-Regolith Explorer (OSIRIS-REx) mission, which began orbiting the asteroid on December 31. Bennu, which is only slightly wider than the height of the Empire State Building, may contain unaltered material from the very beginning of our solar system. Shortly after the discovery of the particle plumes in January, the mission science team increased the frequency of observations, and subsequently detected additional plumes during the following two months. 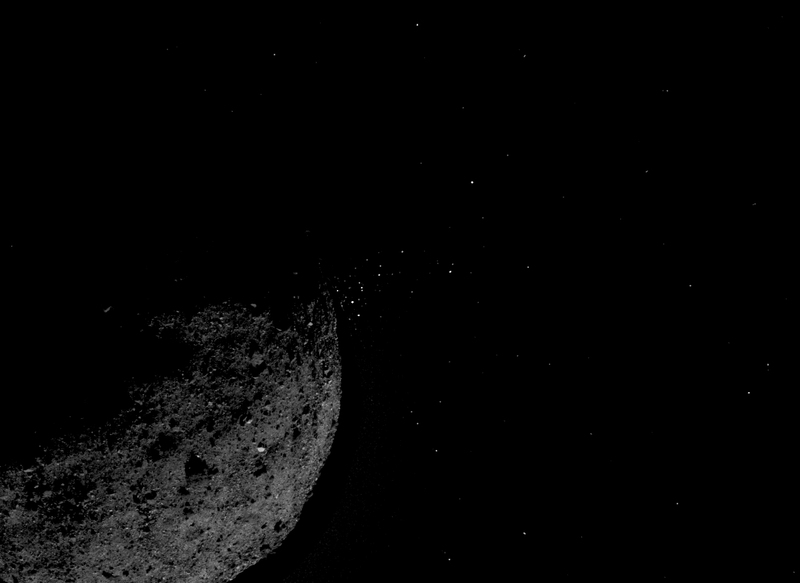 Although many of the particles were ejected clear of Bennu, the team tracked some particles that orbited it as satellites before returning to the asteroid’s surface. The OSIRIS-REx team initially spotted the particle plumes in images while the spacecraft was orbiting at a distance of about one mile. Following a safety assessment, the mission team concluded the particles did not pose a risk to the spacecraft. The team continues to analyse the plumes and their possible causes. The higher-than-expected density of boulders means that the mission’s plans for sample collection, also known as Touch-and-Go (TAG), need to be adjusted. The original mission design was based on a sample site that is hazard-free, with an 82 foot (25 meter) radius. However, because of the unexpectedly rugged terrain, the team hasn’t been able to identify a site of that size on Bennu. Instead, it has begun to identify candidate sites that are much smaller in radius. The OSIRIS-REx science team has made many other discoveries about Bennu in the three months since the spacecraft arrived at the asteroid, some of which were presented at the 50th Lunar and Planetary Conference in Houston. The team has directly observed a change in the spin rate of Bennu as a result of what is known as the Yarkovsky-O'Keefe-Radzievskii-Paddack (YORP) effect. The uneven heating and cooling of Bennu as it rotates in sunlight is causing the asteroid to increase its rotation speed. As a result, its rotation period is decreasing by about one second every 100 years. Separately, two of the spacecraft’s instruments, the MapCam colour imager and the Thermal Emission Spectrometer (OTES) have made detections of magnetite on Bennu’s surface, which bolsters earlier findings indicating the interaction of rock with liquid water on its parent body. Last year NASA found evidence of water in the clays on the surface of the asteroid.